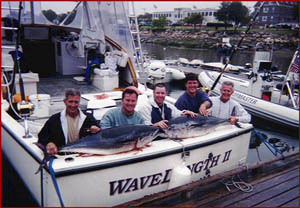 Wavelength Fishing Charters is a full time, dedicated fishing operation. Fishing is all that we do. We have been in business since 1986, and Captain Dave has been fishing the local waters for 25 years. Conveniently located at the Plymouth Town Pier. Come See Us at The Plymouth Town Wharf !